All what you need is to follow your city twitter account in our list here. خدمه اتوماتيكيه للمسلمين في اكثر من 51 مدينه حول العالم للتنبيه بأوقات الصلاه. كل ما عليك هو متابعه حساب تويتر لمدينتك في القائمه هنا .اذا اعجبتك الفكرة لا تدعها تتوقف عندك . كل مدينه يمثلها حساب تويتر يقوم بالتغريد 5 مرات في اليوم فقط ( الصلاوات الخمسه ) . 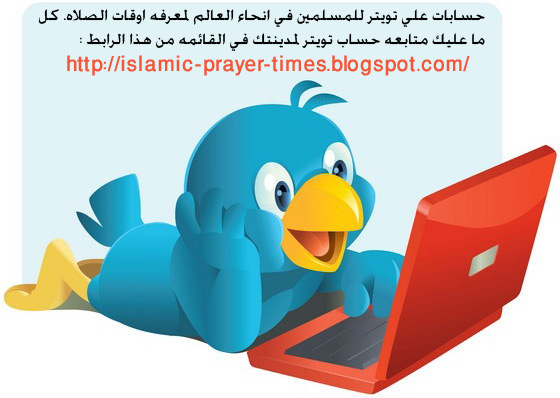 Automatic service for Muslims all over the world to know the prayer times. All what you need is to follow your city twitter account in our list here. Don't let the idea stop at you if you like it. List of cities that are on Twitter now and will be continuously increased, isA. اذا اردت وجود مدينتك هنا او لديك تعليق او استفسار فبرجاء تركه في التعليقات . kindly, if you want your city to be here or have a comment or inquiry please leave it in the comments section . This is independent international project and does not belong to any sect, organization or country.